Some of us are born with a great sense of humor, while others develop one as they get older. Jordanians have an interesting sense of humor, typically leaning towards the satirical/silly side of the spectrum. Either way, it’s bound to make you crack a smile or two. But there’s an art to being funny, or at least to creating comedy. For those who were once the class clown in school or who developed the ability to make people laugh in adulthood and are hoping to pursue a career in comedy, sadly, Jordan isn’t equipped with a specialist school to train and grow their talent. Something had to change, so Roya pushed the envelope. 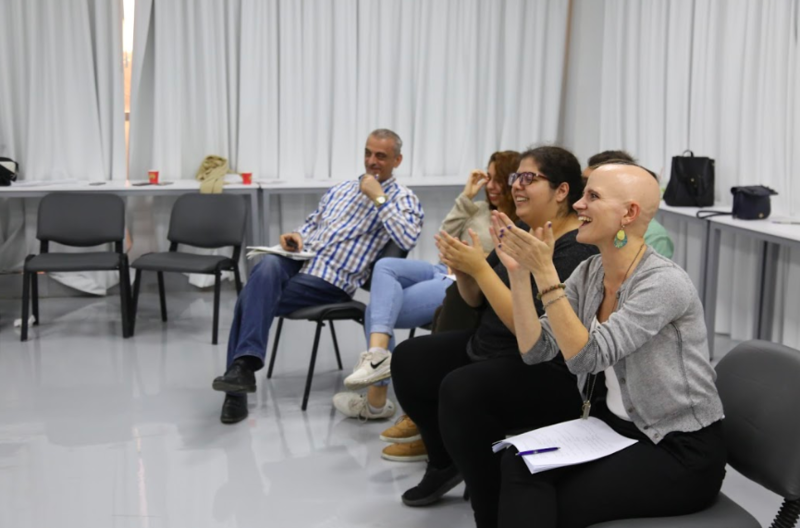 Last week, the Roya Academy for Media Training teamed up with The Second City Training Center, the world’s largest school of improvisational arts and part of legendary comedy institution The Second City, and the US Embassy in Amman to create a five-day improv-to-sketch program. 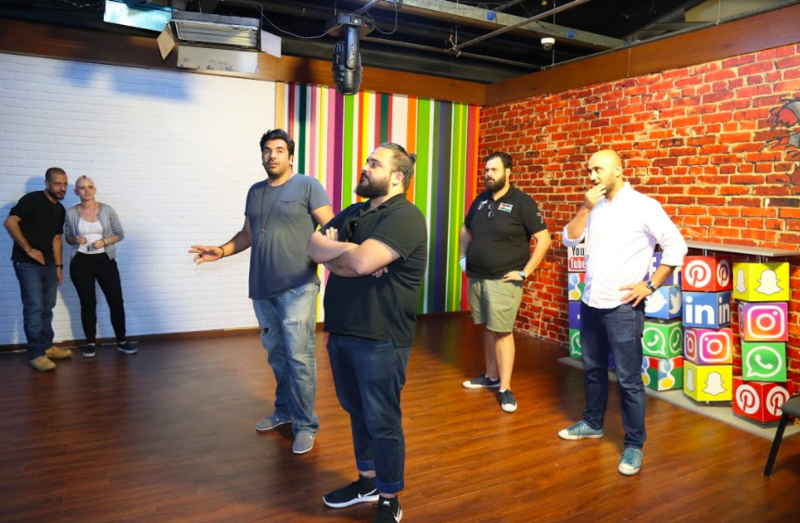 A group of aspiring and professional comedians signed up for the exclusive course, which took place at the Academy’s headquarters in Amman from October 12th-16th. I attended the fourth day of the course to chat to the trainers, Jay Steigmann, Writing Faculty Program Head, and Jessica Mitolo, Writing & Improvisation Faculty from The Second City Training Center, and watch them work their magic in person. When it was game over, the comedians were split into groups of their choice and asked to come up with a sketch to perform for the entire class. The results were hilarious. So hilarious that Sharif al Zoubi was rolling on the floor laughing (seriously!). Sure, the sketches were really funny, but professional comedians in Jordan were all self-taught, which makes total sense as to why Jay had a few constructive comments for each one of them. Her notes were right on point, logical and alerted the comedians to the techniques that must be adapted when creating comedy, to guarantee and maintain maximum laughter. Jessica’s session involved similar exercises and her remarks were equally as constructive as Jay’s. 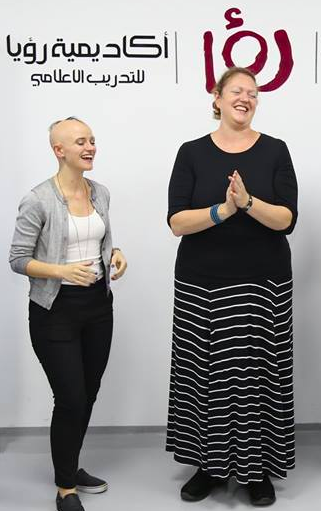 I might have laughed my socks off during the sessions, but did Jay and Jessica find their students as funny as I did? All I had to do was ask. I asked them about their initial thoughts on comedians and comedy in Jordan. “Initial thoughts, I think, in Jordan, but also with beginning comedians is that they hold themselves back so much, they’re not ready to take risks and play the role of the fool and joke around. This is day four and you can see that they’ve begun to take themselves less seriously and to really have fun and smile and go with it and take risks,” Jay said excitedly. Jessica said that there has been a huge transformation in the students since day one, including many of them becoming less timid and less concerned about looking cool and trying hard to be funny. Jessica and Jay told me that they tailored the course based on the comedians and their performance and what they “naturally gravitated toward” in the course. “There are certain things that we tried and thought: ‘maybe this isn’t a shared sense of humor, this is an American sense of humor.’ And today I tailored my improv class into a storytelling class and story theatre class and the response was tremendous,” Jay said. Jessica noted that the professional comedians in Jordan tend to work solo and not in teams. I knew they thought Jordanians were funny, but I tend to like details. “I think everyone (in Jordan) has this sense of humor, some people dry, some people gallus, but funny,” Jay said. Apparently, there is a “greater sense of fatalism” to Jordanian humor. So dark humor it is, and plenty of self-expression. “Very animated, this is a very theatrical culture,” Jay said. But what I really wanted to know was whether Jay and Jessica believe if any of their Jordanian students could ever make it big in the US. “Yes, they should all come. There’s a lot of really great talent and it’s exciting to hear all the work they’re doing and the work they’re excited to do in the future,” Jessica said. The students, both the pros and amateurs, enjoyed the unique course and highly benefited from it. Well-known Jordanian comedian Odai Hijazi said that he has a learnt a lot from this course, particularly how to write comedy scripts. “I work in theatre so I know a little bit about it, but here we were taught how to build a character and create a scene in a comedic way and also in a way that suits Jordanian humor. 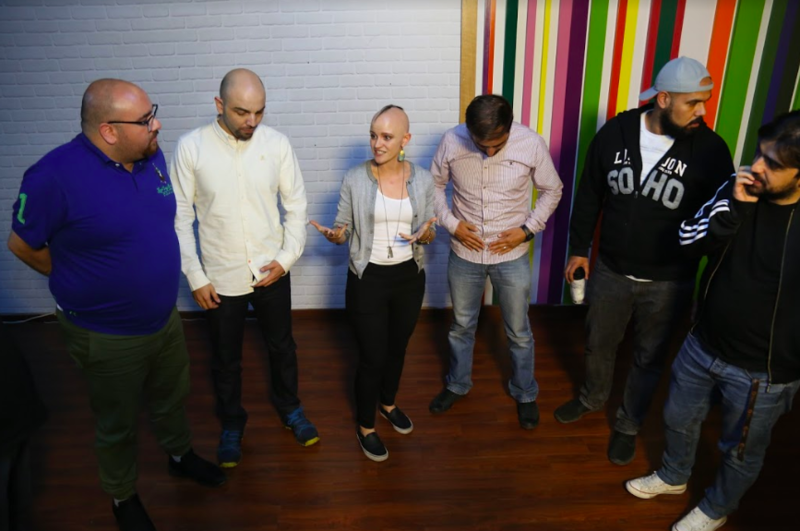 We have very, very few scenarists in Jordan, so this was very important to create new writers who will be able to write great comedy scripts. There is an ABC and rules to the art of creating comedy, and we were taught those here today,” Odai said. The course was more than just about comedy. Could the next Robin Williams, Dave Chappelle or Jerry Seinfeld be right here in Jordan?